A cliff-top pub in danger of collapsing into the sea in Somerset is to shut down at the end of the month. The Blue Anchor, near Minehead, has been left close to the cliff edge following years of erosion and a large landslide in March. Owner Cara Strom said: "I don't have a choice - it will send me into ruin if I keep ploughing money into something that's about to fall in the sea." The pub will be moth-balled when it is no longer safe for Ms Strom to live in. 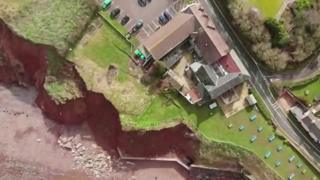 The historic pub, which overlooks the Bristol Channel, has been inching closer to the beach following a succession of landslides. In the spring, another landslip opened up a large crack in the beer garden just metres from the back wall of the pub. Ms Strom, who has been the landlady for 10 years, said she had spent £10,000 of her own money on sea defences to increase the height of the 1920s sea wall and would not spend any more. "I have watched what is happening with the cliff since the land slip in March and financial common sense has prevailed," she said. "How can I make further investment when I don't know if it will be here next summer?" She said closing had been a "difficult decision" but blamed "further erosion" and the "lack of action and communication" by West Somerset Council. "People are very upset and I am very sad but it's a decision that I've had no choice but to make," she said. "I simply cannot do this with such uncertainty in the building's future." West Somerset Council has been approached for comment but has yet to respond.